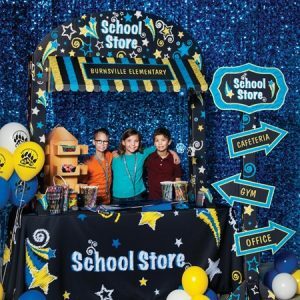 Why choose to start a school store? There are many reasons why schools and/or student councils start a school store. One of the most popular reasons to have a central location where students and community members can go to in order to purchase school spirit products in your school colors. Another reason is to get students involved with the running of the store and/or giving them the opportunity to learn valuable skills like organization, responsibility, accountability, and general business skills. What are your initial and long-term goals for a school store? Once you have made the decision to start a school store it is important to establish both short-term and long-term goals. Short-term goals can range from getting the word out to students and the community about the store, creating a visually appealing store, or a positive response from students and parents. Long-term goals can be turning a profit, increasing school spirit, and more. Who will run the store? Who is charge? Establish who needs to physically be in the store every day and develop a schedule for your school store employees. How much money do want to make? What are your expectations? A short-term financial goal is a good start, but you will need to decide how much profit you want your school store to make by the end of the school year. It’s difficult to advise how much money a particular school should make; this will vary depending upon the size of your school and community. What would you like to do with the money you raise from having a school store?